The theme that is emerging in my posts right now is about quietening the mind and finding peace there. When I am feeling challenged I will search through earlier posts to remind myself of the wisdom that I have shared … and to bring it home again. Enjoy this metaphor… and come back to your breath. You are in control of your kite. I love this metaphor for seeing our breath as the string of our kite. and the breath is like the string of the kite, generally bringing the mind back into the present moment. I have always loved this image. So glad it resonated with you Kimberly! You’re welcome. I’m so glad you enjoyed it. By the way, it was Seamus Heaney’s birthday yesterday! And far too many of us forget that WE hold the string. Val, love this! 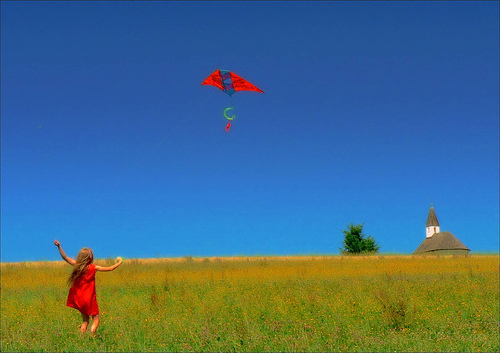 I’m a big fan flying kites and the freedom that comes with it, love the analogy of the breath bringing us back to center! That is a beautiful metaphor. Thanks for re-sharing, Val. Yes indeed Val our mind is indeed so slippery and cannot be controlled by force. But if we start observing our breath calmly the turbulence in our mind will steadily subside and become tranquil. I always love watching kites, Val, but it’s the freedom to soar that captures me. Perhaps this is a better way to think of them. Oh, this is a good one, Val. Our thoughts can fly high and far before we realize it and reel them in!